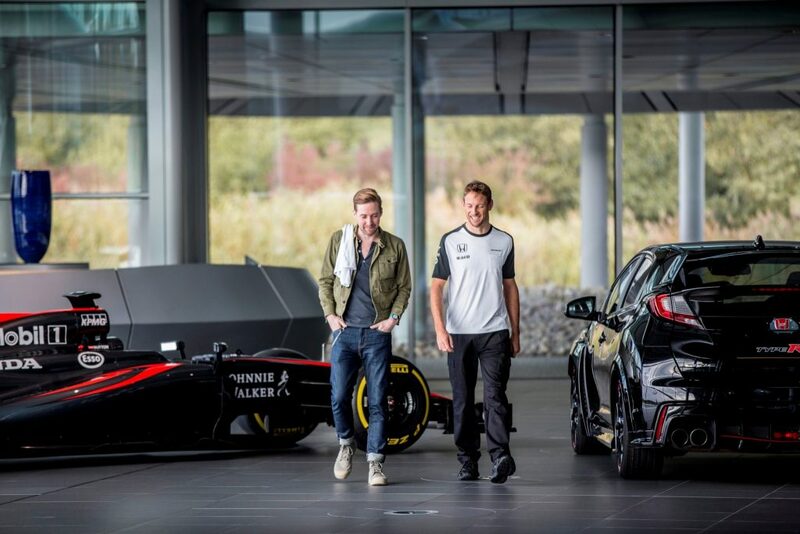 Ricky Wilson, lead singer of the Kaiser Chiefs and Honda Civic Type R ambassador, spent yesterday (Thursday 15th October) being given an exclusive guided tour of the McLaren Technology Centre by McLaren-Honda driver Jenson Button, as well as taking on the McLaren F1 simulator. In front of a huge crowd of fans on the Honda stand at the Goodwood Festival of Speed back in June, Jenson invited The Voice coach and Radio X DJ to the state-of-the-art facility in Woking to see the production side of McLaren for both F1 and road cars but due to the pairs busy schedules the tour has only just been able to take place. As well as taking in the state-of-the-art Formula One facility, the immaculate McLaren Road Car production line and the on-site wind tunnel, Ricky was put to the test in the F1 simulator. This is where Jenson prepares for each grand prix, learning the tracks and refining the car’s set-up for the weekend ahead. For Ricky, it was a baptism of fire – he was given a crash helmet and a pair of driving gloves before immediately being strapped into the cockpit for some super-fast laps of the Circuit Of The Americas, the venue for next week’s US Grand Prix. “I am so glad Jenson had gone by the time I got into the simulator as I don’t think the boys at McLaren had ever seen anyone roll it before now,” said Ricky Wilson. “When it comes to toys; they don’t come any bigger or better than that and I feel extremely lucky to be one of the very few people to have experienced it. I thought my Civic Type R was quick but that is a whole new level. “Signing Ricky to the Honda family was a fantastic decision,” said Phil Crossman, Managing Director of Honda UK, “Not only is he a rock star but he’s now a fully qualified racing driver with a race car for the road in the new Civic Type R. Jenson taking him around the McLaren Technology Centre can only serve to further fuel his passion for all things automotive.